Written by leading theorists and empirical researchers, this book presents new ways of addressing the old question: Why did religion first emerge and then continue to evolve in all human societies? The authors of the book—each with a different background across the social sciences and humanities—assimilate conceptual leads and empirical findings from anthropology, evolutionary biology, evolutionary sociology, neurology, primate behavioral studies, explanations of human interaction and group dynamics, and a wide range of religious scholarship to construct a deeper and more powerful explanation of the origins and subsequent evolutionary development of religions than can currently be found in what is now vast literature. While explaining religion has been a central question in many disciplines for a long time, this book draws upon a much wider array of literature to develop a robust and cross-disciplinary analysis of religion. The book remains true to its subtitle by emphasizing an array of both biological and sociocultural forms of selection dynamics that are fundamental to explaining religion as a universal institution in human societies. 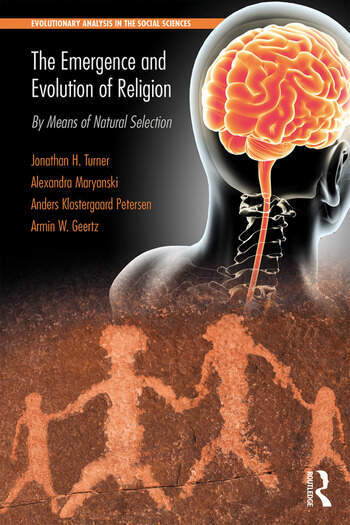 In addition to Darwinian selection, which can explain the biology and neurology of religion, the book outlines a set of four additional types of sociocultural natural selection that can fill out the explanation of why religion first emerged as an institutional system in human societies, and why it has continued to evolve over the last 300,000 years of societal evolution. These sociocultural forms of natural selection are labeled by the names of the early sociologists who first emphasized them, and they can be seen as a necessary supplement to the type of natural selection theorized by Charles Darwin. Explanations of religion that remain in the shadow cast by Darwin’s great insights will, it is argued, remain narrow and incomplete when explaining a robust sociocultural phenomenon like religion. Jonathan H. Turner is 38th University Professor, University of California System, Research Professor, University of California, Santa Barbara, and Distinguished Professor of the Graduate Division, University of California, Riverside. He is also Director of the Institute for Theoretical Social Science, Santa Barbara, CA, USA. Alexandra Maryanski is Professor of Sociology at the University of California, Riverside, USA. Anders Klostergaard Petersen is Professor at the Department for the Study of Religion, School of Culture and Society, Aarhus University, Denmark. Armin W. Geertz is Professor in the History of Religions at the Department for the Study of Religion, School of Culture and Society, and Jens Christian Skou Fellow at the Aarhus Institute of Advanced Studies, Aarhus University, Denmark. Turner et al. 's account is easily the best of those that attempts to place religion in the context of biological evolution. The books' grounding in the physiological literature, especially on the brain organs and connections involved in emotion, memory, gesture, and language, combined with a mastery of the details of hominid, evolution, makes for an impressive statement. Further combined with Turner's comprehensive theory of the elements of human social interaction and institutions, this is a strong statement not just of how human evolution happened but what problems had to be surmounted.